Today we say happy 5th birthday to Expedition Everest, one of the most unique and amazing roller coasters in the world. 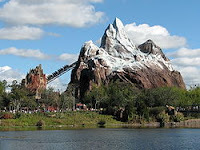 This attraction celebrated its grand opening on April 7, 2006 in the Asia section of Disney's Animal Kingdom. Bob Iger, president and CEO of the Walt Disney Company presided over the opening ceremony and the first official riders were six young stars of the Disney Channel original movie, "High School Musical." Just like most new rides at Disney World, many guests were able to experience "soft openings" that started as early as January of 2006. Expedition Everest is a technological marvel that is nearly 200 feet tall. At 320 feet above sea level, it is actually the second tallest summit in the state of Florida. Not only does the train themed coaster reach speeds of 50 mph down an 80 foot drop, but it also travels backwards through the inside of the dark mountain at over 30 mph. Now 30 mph may not sound too scary, but it is actually faster than Space Mountain! There is no question that this is one of the most exciting rides in Walt Disney World, but it is so much more than just a roller coaster. The details that the Imagineers incorporate into this six acre attraction are simply incredible. It all starts in the queue line which is designed to look like a small Asian village that includes a museum that is dedicated to the legend of the Yeti. Although most of us like to avoid long lines and grab a fastpass for popular attractions, I encourage you to wait in the standby line at least once. Most of the props were brought back from actual Asian villages near the Himalayan Mountains. This queue could almost be considered and attraction by itself. In addition to a great queue line followed by a roller coaster that travels both forwards and backwards, there is one more engineering marvel that needs to be mentioned. 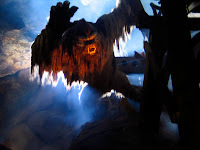 Just before the last big drop near the end of the Expedition Everest experience, the train is attacked by a 22 foot tall audio-animatronic Yeti. To make this abominable snowman move smoothly and appear lifelike it has more power and thrust than a 747 jet engine! The Yeti is covered in "skin" that measures 1,000 square feet, and is held in place by 250 zippers and 1,000 snaps. Although he is only seen for a split second, the Yeti is truly a sight to behold. Disney spared no expense in creating Expedition Everest which is the most expensive roller coaster ever built at over 100 million dollars. It also won the 2006 Theme Park Insider Award for "World's Best New Theme Park Attraction." Although it can handle 1,800 guests per hour, it is an attraction that should be experienced early in the morning or at the end of the day if you want to avoid the long lines. Expedition Everest is definitely one of my favorite attractions in all of Disney World, especially at night. It is also a favorite of our 4 year old son. Although he is not quite brave enough (or tall enough) to ride it yet, he is in awe of this attraction. On a recent trip, we went to Animal Kingdom one morning for the sole purpose of bringing our little man to his favorite spot. He stood at the base of the mountain and was mesmerized watching train after train come screaming down the big drop. I think he would have stood there all day if he didn't get hungry for some chicken fingers at Restaurantosaurus! As I was finishing this article, I got news of some history being made on the other side of the world. Just moments ago, Disney held its groundbreaking ceremony for Shanghai Disneyland, which will be its twelfth major theme park worldwide. Just as he did five years ago at the grand opening of Expedition Everest, Bob Iger presided over today's ceremony in China. Shanghai Disneyland is scheduled to open in about five years.